#1 New York Times bestselling author Brad Thor brings us his darkest and most intriguing thriller yet—a terrifying story of espionage and betrayal—brilliantly paced with superb nonstop action.Born in the shadows and kept from heads of state, there are some missions so deadly, so sensitive, that they simply don’t exist. When one such mission goes horribly wrong, a wave of dramatic terrorist attacks is set in motion. Their goal: the complete and total collapse of the United States. With the CIA’s intelligence abilities hobbled, former Navy SEAL Team 6 member turned covert counterterrorism operative Scot Harvath launches an audacious plan to infiltrate the terrorists’ network and prevent one of the biggest threats the United States has ever faced. Simultaneously, a foreign wet work team has been sent to California. Their target: one of Hollywood’s most famous filmmakers. While working on a secret documentary project, movie producer Larry Salomon has unknowingly exposed one of the world’s wealthiest and most politically connected powerbrokers—a man with a radical anti-American agenda poised to plunge the nation into deadly, irreversible chaos. As the plots rocket to their pulse-pounding conclusion and the identities of the perpetrators are laid stunningly bare, Harvath will be left with only one means to save America. Unable to trust anyone, he will be forced to go Full Black. 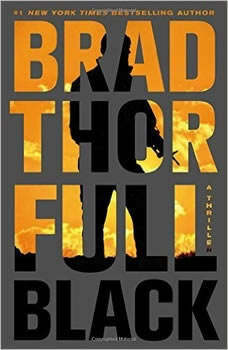 Intense and frighteningly realistic, Full Black is, hands down, Brad Thor’s most riveting thriller to date.